As a means of practising your map-reading skills you may like to try answering the following questions. 1. 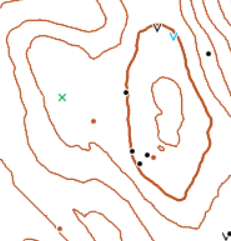 How many mine shafts are marked on the initial portion of map? 2. 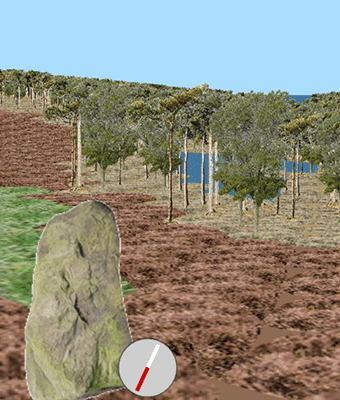 What types of vegetation can be seen within the initial visible range of 60 metres? 3. How many boulders lie within the initial visible range? 4. Given that the interval between contours represents 5 metres height difference, estimate the height in metres above lake level of the highest point within the initial visible range. 5. 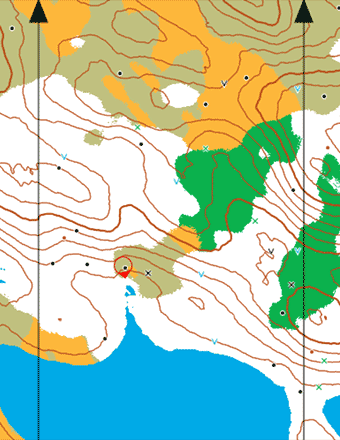 What kind of terrain is at the spot 200 metres due east from the starting point? 6. From the starting point, what form does the nearest man-made object take? 7. How many buildings are there in the nearest built-up (paved) area? 8. (a) What does the visible range need to be set to in order for it reach the nearest built-up area? (b) If you do that, can you see the buildings? If not, why not? 9. South-east from the starting point, on the initial portion of map, there is a neck of land between two lakes. (a) What type of terrain is found there? (b) What point features are marked there? (c) Estimate the height of the highest point on this neck. 10. Just over 150m roughly due east from the starting point there is a mine shaft surrounded by a contour. Does this contour indicate a slight rise or a slight dip in the ground? You don't need to visit the scene, the map does indicate the answer. How? 11. The initial portion of map shows parts of several lakes. If you move the map to see the whole of those particular lakes, do they contain any islands? 12. 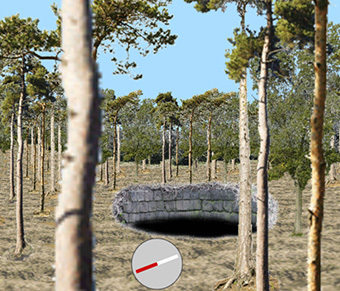 If you move east to the position shown here you will see a significant object on the ground which is not marked on the map. Why is it not marked? 13. At x = 0, y = 0 there is a large lake. Describe what can be found on each of the islands in this lake. 14. On the northeast side of the lake in the previous question the ground slopes up very steeply. (a) How can we tell it is steep? (b) Part way up this hill there is a significant hollow. Estimate the height in metres above lake level of the centre of this hollow. 15. Not far from the same lake there is a place where the contours and point features look like this: (on this map fragment the vegetation types have been switched off). What are the approximate (x, y) coordinates of this place? 16. 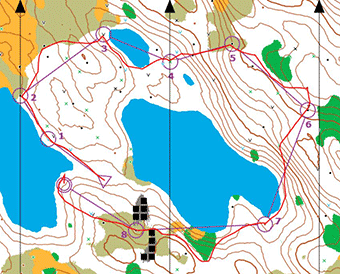 Notice that the tracks (dashed black lines) shown around the starting area do not have any steep sections because they roughly follow the contours. Estimate the height change between the southernmost and northernmost track ends.